Southern Illinois University Edwardsville is serving the needs of community educators through the Great Rivers Math Teachers’ Circle (MTC). The program is part of a network that seeks to grow and enrich the nation’s science, technology, engineering and mathematics (STEM) teaching force by engaging teachers in problem-solving and collaborative brainstorming, and building a community of mathematics professionals. The MTC Network is a project of the American Institute of Mathematics. 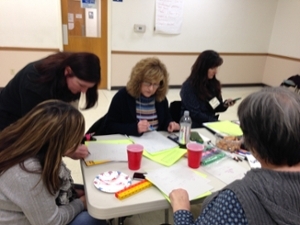 SIUE’s Tammy Voepel, associate professor of mathematics and statistics, Adam Weyhaupt, chair of the Department of Mathematics and Statistics, and Sharon Locke, director of the SIUE STEM Center, partnered with two area math educators to bring the national initiative to the area. The MTC Network has now partnered with 100Kin10, a national network coordinating and accelerating efforts to bring 100,000 new excellent STEM teachers into schools by 2021. As part of 100Kin10, the MTC Network has committed to reach 6,000 teachers and their 600,000 students by growing its national network from 80 to 300 Math Teachers’ Circles by 2020. Middle and high school math educators, administrators, and community college and university faculty are invited to join the movement and attend the upcoming Great Rivers MTC’s at the Main Street Community Center in Edwardsville. They will meet from 5:30-7:30 p.m. Thursdays, Feb. 25, March 24 and April 28. For more information and to RSVP for future Circles, visit stemideas.org/math-teacher-circle.